Andover, MA - MKS Instruments, Inc. (NASDAQ: MKSI), a global provider of technologies that enable advanced processes and improve productivity, has announced at SPIE Photonics West Ophir® BeamWatch® Integrated, a fully automated, non-contact laser measurement system designed to measure critical beam parameters in industrial production environments. A rugged, compact, self-contained system, BeamWatch Integrated measures parameters of the focused beam in real-time, including focus spot size, beam caustic, and absolute power readings. The system can accommodate different types of welding heads and includes a variety of interfaces, such as PROFINET and Ethernet/IP, for integration into production networks and automated manufacturing lines to facilitate direct transfer of measurement data. BeamWatch Integrated is a patented, non-contact profiling system that accurately captures and analyzes industrial lasers for wavelengths from 980nm - 1080nm and laser powers to 10 kW (30 kW, on request). The system provides real-time beam measurements of lasers that are typically too powerful for direct readings. Instead, it measures Rayleigh Scattering using a pass-through beam measurement technique that involves no contact between the instrument and the beam. 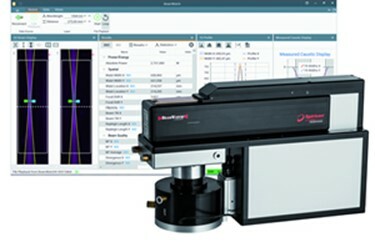 Beam parameters measured include focus spot width and location, focal shift, centroid, M2, divergence, beam parameter product, Rayleigh length, beam tilt angle, and absolute power. Because there is no contact with the beam, there is no wear on the instrument, minimizing the need for maintenance. "Ever more powerful cutting and welding laser equipment is being used on today’s production lines, but due to lack of time or complexity, the quality of the laser beam often goes unchecked during the process," said Reuven Silverman, General Manager, Ophir Photonics. "This can lead to large batches of defective parts, higher risk of loss, or safety issues in high-throughput production lines. BeamWatch Integrated addresses these problems by providing simultaneous measurements of multiple profiles along the beam caustic, delivering the key ISO 13694 and ISO 11146 laser beam parameters in fractions of a second." BeamWatch Integrated monitors high power YAG, fiber, and diode lasers in the 980-1080nm range. It charts all beam measurements over time in industrial material processing applications, such as welding and cutting operations in automotive, heavy equipment, and appliance manufacturing, or in oil & gas drilling. High magnification optics measure beams with spot sizes down to less than 80 µm or less, allowing for smaller, more precise cuts with less waste of material. Fast measurement times allow the laser beam to be checked automatically during the loading/unloading phase, as frequently as once every unit produced. All parameters are displayed and stored; trend diagrams deliver useful insights for predictive maintenance. Tolerances and limit values can be set to trigger corrective actions. BeamWatch Integrated is available now. OEM prices available on request. MKS Instruments, Inc. is a global provider of instruments, subsystems and process control solutions that measure, monitor, deliver, analyze, power and control critical parameters of advanced manufacturing processes to improve process performance and productivity for our customers. Our products are derived from our core competencies in pressure measurement and control, flow measurement and control, gas and vapor delivery, gas composition analysis, residual gas analysis, leak detection, control technology, ozone generation and delivery, power, reactive gas generation, vacuum technology, lasers, photonics, sub-micron positioning, vibration control and optics. We also provide services relating to the maintenance and repair of our products, installation services and training. Our primary served markets include the semiconductor, industrial technologies, life and health sciences, research and defense. Additional information can be found at www.mksinst.com. Ophir is a brand within the MKS Instruments Light & Motion division. The Ophir product portfolio consists of laser and LED measurement products, including laser power and energy meters, laser beam profilers measuring femto-watt to hundred-kilowatt lasers, high-performance IR and visible optical elements, IR thermal imaging lenses and zoom lenses for defense and commercial applications, OEM and replacement high-quality optics and sub-assemblies for CO2 and high-power fiber laser material processing applications. Ophir products enhance our customers’ capabilities and productivity in the semiconductor, industrial technologies, life and health sciences, research and defense markets. For more information, visit www.ophiropt.com/.